It might be not be the coolest vehicle on the road, but the minivan is a useful ride for families that want space and good utility. But there’s usually one major downfall: no all-wheel drive. The loaded $45,123 Toyota Sienna XLE Premium I drove is the only minivan to offer AWD, giving it a leg up on the competition. The sure-footed minivan easily tackles a gravel road and is more confident in the corners. There’s still a good deal of body lean in the corners which is part of the higher center of gravity, so keep the driving smooth. But there isn’t any torque steer when you mash the gas pedal like FWD vehicles with more power seem to have. That’s good, because the V6 engine really moves this not-so-minivan with authority when needed. It’s no muscle machine but other minivan drivers need to respect the Sienna semblance of speed. The brakes are very strong and stops with five people and some cargo are uneventful. There is a host of safety tech on the Sienna, which offers some peace-of-mind for families. The eight-speed automatic is very smooth and seems to switch to a higher gear as quickly as possible for better fuel economy. My AWD Sienna managed 20.3 mpg for the week, right on with the sticker at 20 mpg, but that is less than a FWD version by a few miles per gallon. Inside space in a minivan is a top selling point and Sienna seems to be bigger than most. If you want more room, the minivan trumps all but the largest crossover or SUV. The driver has a comfortable spot with an eight-way power seat and clear vision around the big ride. My tester came with leather seating for seven. The second row captain’s chairs make getting around the cabin easier. 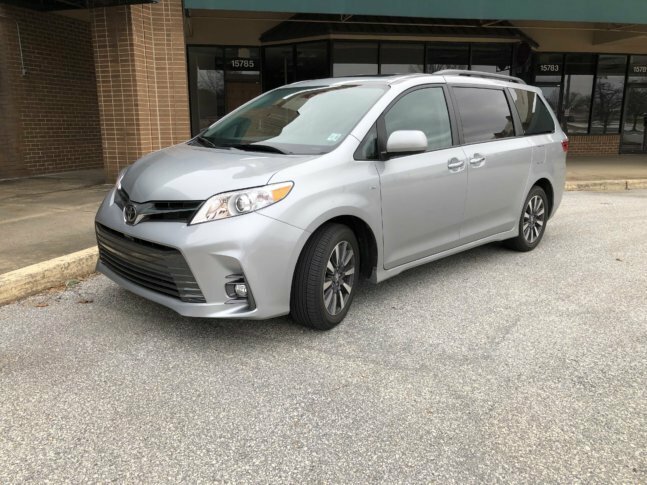 Where in many crossovers, the third row is a penalty box to be avoided, the Sienna third row bench has space for adults and it’s comfortable enough for a real trip. For families with smaller children or looking to grow, the Sienna has four latch systems, two each in the second and third rows. When that third row isn’t needed the seat folds into a large well allowing a flat floor for larger items. The Sienna XLE Premium also comes with dual view Blu-ray rear seat entertainment for those riding in the back. The seven-inch touch-screen is easy to use, if a bit small; the knobs on the right side of the screen can be a reach for drivers. Toyota has finally added Apple CarPlay capability but not for Android phones at this time. The Sienna is large on the outside and it takes up a good deal of real estate when it’s parked. Front end styling is busy with two grills: One wide, the other slender. It does stand out more than some other minivans. A look at the side of the Sienna and you’ll notice it’s large with many straight lines. The XLE trim level adds a larger 10-spoke, 18-inch wheels that give it some flair. Dual power sliding doors and power rear hatch are big advantage of a minivan for easier entry and exit. Glass is plentiful so everyone has a view. Luckily most of the glass, including the rear hatch, is tinted on this version. If you need extra storage, the roof rack can free up valuable space inside. Toyota has made the minivan more appealing with AWD. It’s larger and cheaper to buy than a large crossover. If you can overcome the minivan stigma, the Sienna XLE Premium is a capable all-around family ride.